Arrive on Sunday evening, depart before lunch on Friday having enjoyed a fabulous few days in good voice, with great company! 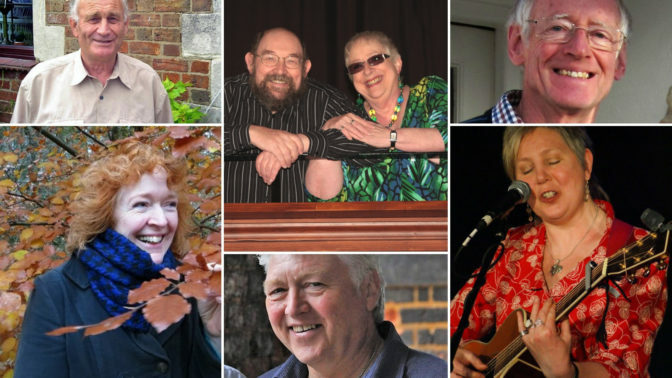 This is a friendly mid-week gathering for singers of all ages and abilities to enjoy and explore folk song and singing in a convivial and supportive atmosphere, with opportunities to learn how to look after and improve both your voice and performance. Tom and Barbara Brown: Hosts for the weekend. Grounded in the living tradition of the West Country, these two have a long history of encouraging and enthusing amateur and new performers to share songs and singing, and creating a relaxed and friendly atmosphere in which to do it. Bonny Sartin: Bonny, the voice of The Yetties, has years of experience in singing and entertaining an audience. There is little he cannot impart about confidence, presentation, and approaches to songs and singing – but his knowledge extends way beyond that – to song collectors, square riggers and Halsway ghosts! Janet Russell: As well as being a member of the renowned Sisters Unlimited and JigJaw and, of course, her solo career, Janet also runs not one, but three community choirs, so she knows what she’s talking about when it comes to the voice! Jim Mageean: Widely known and respected internationally as ‘Shanty Jim’, his knowledge and skill goes far beyond shanties and maritime songs – into songs of the North East and singing with other performers. Jim has also been a tutor on the Folk Music degree course at Newcastle University. Marianne McAleer: A delightful London-Irish singer and interpreter of traditional Irish song, Marianne’s enthusiasm in infectious. She is a multi-award winner at the All-Britain and All-Ireland Fleadh Cheoil and is now a judge for singing and traditional style. Jeff Wesley: Jeff is what has become known as a ‘source singer’. A retired Northamptonshire farmer, Jeff’s repertoire runs from the sublime to the ridiculous – from old ballads to modern ditties. He gleans any song that appeals to him, irrespective of origin, and makes the song his own with a laid-back and captivating style!